Make files invisible on your computer. Is there a better alternative to inVIZible? Is inVIZible really the best app in Security category? Will inVIZible work good on macOS 10.13.4? inVIZible...Perhaps a good way of protecting important files is to make them invisible instead of locking them. What if you forget the locations of the files you have made invisible? inVIZible lets you manage and organize the files that you have made invisible. 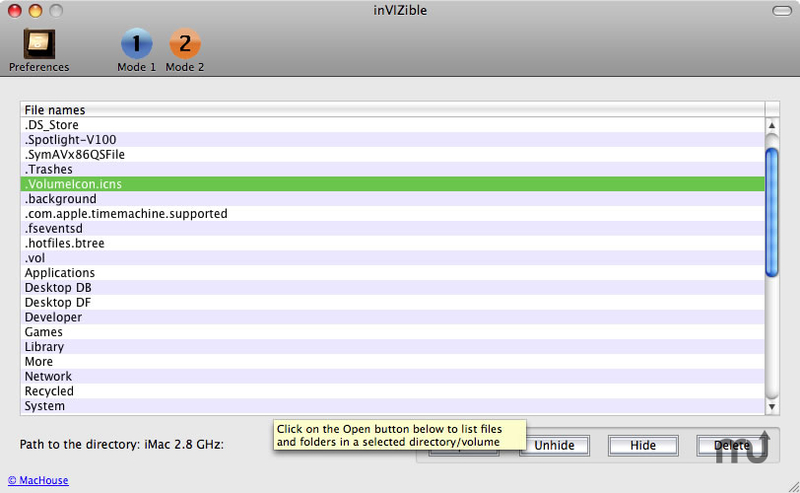 inVIZible's Mode 2 lets you select a directory or volume to load. Then you can hide, unhide or delete a selected folderitem. Mode 2 can list files and folders that most other applications including Titanium Software's OnyX can't display. Supports an update notification feature. With this update, users can list visible/invisible files and folders in a selected directory/volume that most other appliations cannot display. See Mode 2.
inVIZible needs a rating. Be the first to rate this app and get the discussion started!